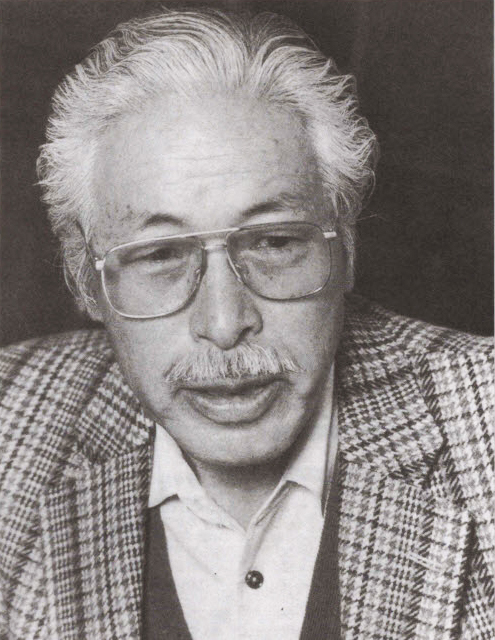 Ivor Mairants writes about Masaru Kohno in his book “My Fifty Fretting Years” published in 1980. 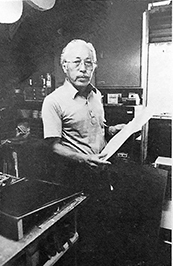 “In 1963 I first met Masaru Kono who has since changed the spelling of his last name to Kohno. He then produced a whole range of excellent classical guitars from No 2 to No 10, and when my order was delivered in London in the autumn, Julian Bream happened to come into the shop and asked if I had any “new machines” I showed him the Kohnos and it did not take long for him to select one of the lower priced models (about 80 pounds), take it away, and use it in concerts. He tells me he still has it and uses it. 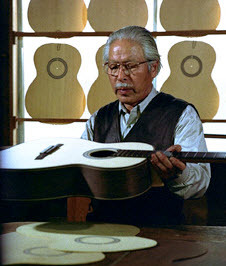 The people who still may be wondering what caused the Japanese to become guitar makers may well wonder how Masaru Kohno learnt his craft. Well, during 1959 he went to Madrid and presented himself at No 12 Jesus y Maria, the workshop of Arcangel Fernandez, and, through a friend who spoke Spanish, asked if he could watch Arcangel at work, Arcangel, being a most friendly and straightforward person, did not object, and so the visits began. Masaru Kohno would often take Arcangel out to lunch or dinner, and generally treated him with great friendship which Arcangel reciprocated. 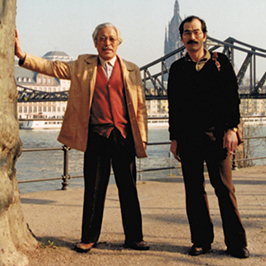 Between interpreters and drawings, Arcangel’s work was carefully noted by Kohno, and after visits almost every day for about six months, Masaru had seen enough for his purpose, and left Madrid to establish his own workshop in Tokyo. Ivor Mairants relates the story below without comment as it was told to him by Arcangel. 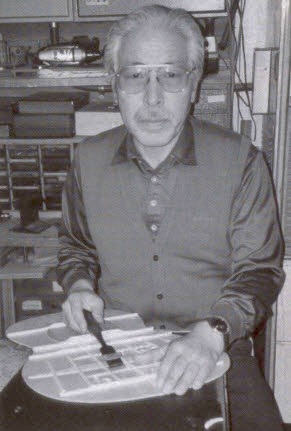 Masaru Kohno entered one of his guitars at the Liege Concours National de Guitares in 1967, and won the first prize for guitar making out of 31 entrants. The chairman of the adjudicators was my late lamented friend Ignacio Fleta (who died in 1977) and he told me that when he examined Kohno’s guitar (which of course was unlabeled at the time) he thought it was very much like his own.” (On the judge’s panel were, among others, Ignacio Fleta, Robert Bouchet, Joaquin Rodrigo, and Alirio Diaz, Noted French Luthier Daniel Frederich won the Silver medal in the competition, a sale of a Frederich in 2015 brought $60,000 US dollars). a drastic change from his 1959 head style, and nothing even remotely resembling Archangel Fernandez’s head design. 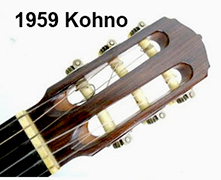 Fleta’s comment at the Belgium competition in 1967 was he thought the unlabeled Kohno closely resembled his own guitars. It was apparent then that Kohno was an international master builder. 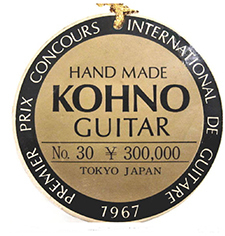 Ignacio Fleta, Robert Bouchet, Joaquin Rodrigo, and Alirio Diaz agreed giving Kohno’s guitar first prize in a field of 31 competitors that included Danial Frederich. I have owned many Kohnos and they have all been concert quality guitars. The guitars offered on this site are top-level concert guitars at an affordable price for the player that appreciates a vintage instrument with minor cosmetic flaws. My background includes 40 years of guitar playing, a BFA in classical guitar performance from the University of New Mexico, four summers of playing and studying under Emilio Pujol at his International Course of Guitar Lute and Vihuela in Cervera Spain. Associate professor under Hector Garcia at UNM, numerous recordings, and concerts. I play with fingertips so the sound will be somewhat different than those who play with fingernails. The sound recordings of the guitars are my own. As Kohno grew his business over the years his numbering system changed. First he started with simple numbers like 421 and 821. I suspect those numbers stood for finish dates 421 being April 21. Then he started model numbers like no 4, no 5 no 10 etc. Where the number reflected the price in Japanese yen. As time passed the numbers grew in size to reflect new pricing. So a model No 30 would have been 300,000 yen and a model No15 would have been 150,000 yen. I suspect he did this because of the high level of inflation in Japan in the early ’70s and the increase in demand for his guitars. He needed to raise his model numbers to keep up with the changing Yen value. The numbers grew to a No 50 model and finally a number 80 model. Around 1982 he began calling his models, Maestro, Special, Professional, and Concert. While the numbers reflected the fanciness of the guitar, the sound quality of the instruments wasn’t necessarily better as Julian Bream proved when he chose a lower priced model number out of a batch of Kohnos in Ivor Mairants’s shop. My good friend and renown painter Manuel Lopez Cia would comment at shows when people would stick thier noses up to one of his works. “Paintings are meant to be seen, not smelled.” The same can be said of vintage guitars. They are meant to be heard and not nitpicked for cosmetic flaws. You want structural integrity, playability and sound to be the driving factors in your decision to purchase any vintage guitar. Guitars improve with age, but more than anything else they improve by being constanty played. 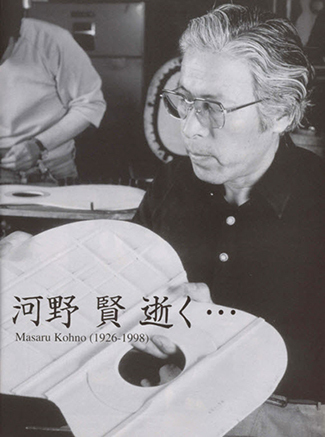 “Masaru Kohno (1926-1998) is not only the most important luthier to emerge from Japan, but also one of the best worldwide. He was born in Mito City, Japan, and in 1948 he graduated from the Tokyo College of Arts and Crafts with a degree in woodcraft. It was during this time that he became interested in guitar construction, and in 1959 he traveled to Spain to learn the craft. Kohno apprenticed for six months at the workshop of Arcangel Fernandez, and although neither could speak a word of the other’s language, they managed to communicate. 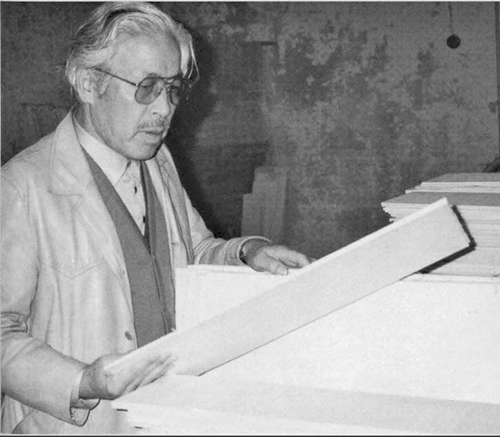 Kohno’s apprenticeship consisted mostly of sitting in the back of the shop and quietly–-but attentively–observing the master Fernandez at work. Kohno’s quiet learning paid off. 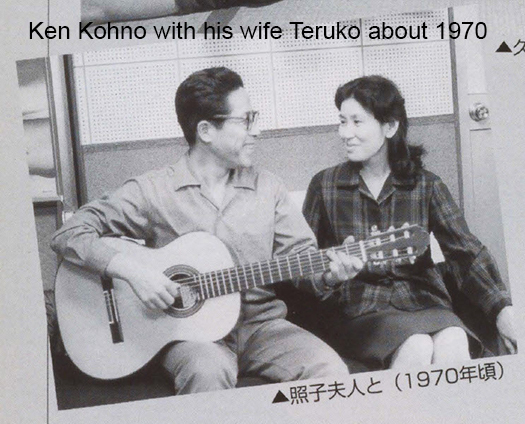 Upon his return to Tokyo he established his own workshop and quickly gained recognition among Japanese guitarists. His international debut came in 1967, when he was awarded the Gold Medal at the Elizabeth’s Concourse International Guitar Building Competition in Belgium. 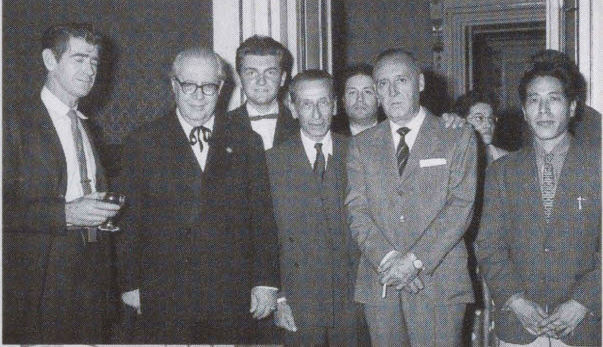 On the judge’s panel were, among others, Ignacio Fleta, Robert Bouchet, Joaquin Rodrigo, and Alirio Diaz. Photo courtesy of Gendai magazine. “A wide variety of recitalists have played his guitars, including Julian Bream, Vladimir Mikulka and John Mills. Both Sharon Isbin’s Classical Guitar Vol II: Bach, Britten, Brower and Martin Mysilveck’s Umlecky Portret Martina Msylivecka, (Panton, 1981) were recorded on Kohno guitars. 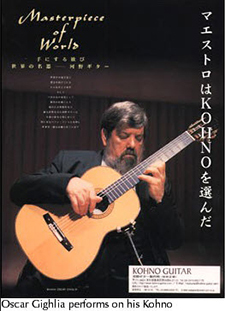 Frederic Zigante is currently using a Kohno guitar in concert and on his recordings which include the complete guitar works of Villa-Lobos and Paganini. He is currently professor of guitar at the Conservatory of Trieste, Italy, and has concertizes over Europe, Japan and China. I think Kohno was making a more playable and musical guitar than the 70’s and 80’s Ramirez, but you can see the influence in the string length, ebony neck reinforcement strips, and other nuances. I had a 1982 664mm string length Ramirez that gave me tendinitis which was seriously debilitating, and my hands are good sized and fingers are sturdy. I like a good Ramirez but the influence of Segovia’s big hands on the neck width and string length was a bad turn in the history of guitar making. Many people struggled, and still do, to play the Spanish 2×4 neck of that period. Kohno must have been influenced by the marketplace, but he made a more interesting and playable guitar than the Spaniards within that paradigm, in my (newly formed) opinion. I studied for awhile with Ray Reussner, who studied with Segovia in the 60’s and beyond. He said he asked Segovia once why he switched from the Hauser to Ramirez, and although I’m sure Spanish pride had something to do with it, Segovia’s answer was the Hauser neck was too small now. So one man’slarge hands influenced a generation of Spanish makers; wild. I remember a Japanese student of Parkening’s in the 70’s struggling mightily with his big Ramirez. On the other hand we’re lucky; if Segovia had started touring the world with a new Kohno in 1963, the 60’s Kohno’s would be (if you could get one) in the $40,000 and up price range. So we can thank the Spanish tradition for the part it played in Kohno’s work, and Segovia for distracting the world in the direction of Ramirez. 🙂 Thanks again for your website and knowledge; I was fortunate to discover it. In his book A Collection of Fine Spanish Guitars from Torres to the Present author Sheldon Urlik quotes Maurice J. Summerfield as placing Smallman on the continuum of guitar developement with Torres, Manual Ramariz, Hauser I, Fleta, Kono (Kohno), Rubio and Romanillos. 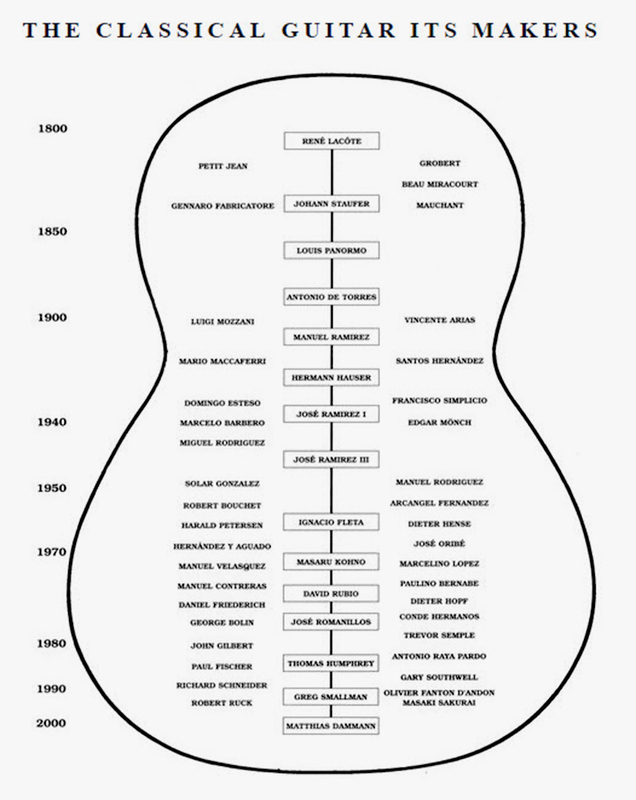 Summerfield’s book is entitled The Classical Guitar – Its Evolution, Players, and Personalities since 1800. A 1963 Kohno is featured on page 110 of Urlik’s book. Below is the chart from Maurice Summerfield’s book mentioned above.